What More Will It Take to Arrest Darren Wilson? 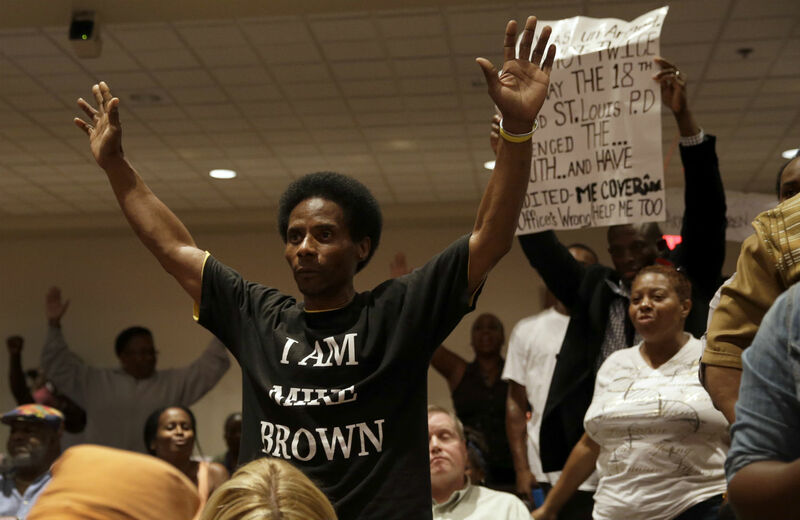 New witnesses to the Michael Brown killing say he had his hands up when he was shot by police. Two men, shocked at what they saw, describe an unarmed teenager with his hands up in the air as he’s gunned down by a police officer. They were contractors doing construction work in Ferguson, Missouri, on the day Michael Brown was killed.And the men, who asked not to be identified after CNN contacted them, said they were about 50 feet away from Officer Darren Wilson when he opened fire. An exclusive cell phone video captures their reactions during the moments just after the shooting. At this point, I need someone to answer this question for me like I’m stupid: What else is needed to arrest Darren Wilson? I’m not asking what a prosecutor would need to for a murder conviction, or even what a grand jury would need to bring formal charges. What else is needed for police to say, “Darren Wilson, you shot and killed someone, you are under arrest”? What more? At least six witnesses have given near-identical accounts of what happened to Michael Brown. A shot was fired, Brown ran, Wilson kept firing, Brown put his hands in the air, and Wilson kept shooting. The autopsy shows Brown was hit six times. He was unarmed. What more do you need to make an arrest? And I’m not of the belief that arrest, a trial or even imprisonment constitute real justice. That punishment model does not create a more just world. But currently, it’s what we have. If under this system, the value of black life is such that an 18-year-old can be shot and killed in cold blood and the police can’t even place the person responsible in handcuffs—a month and counting later—I find it difficult to maintain faith that we’ll one day move to model of justice that respects black humanity. Our lives are too expendable.